Coding Games Unplugged! Awesome Coding Ideas to do OFFLINE! 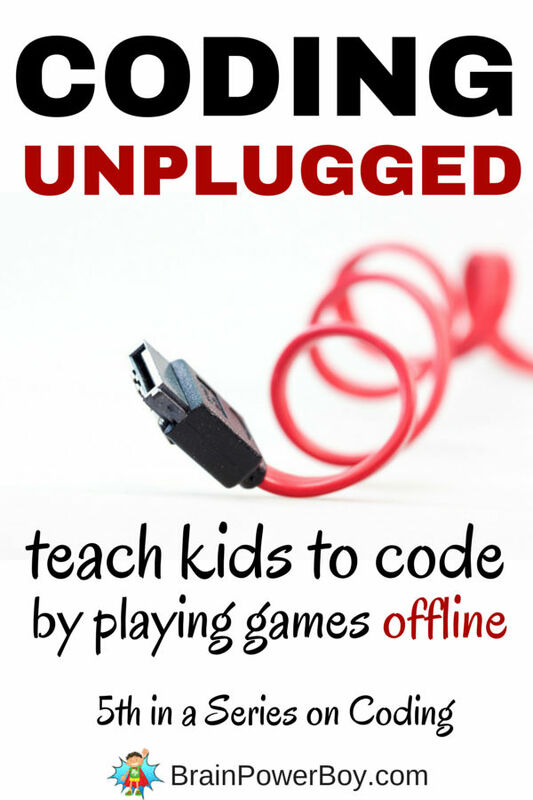 Did you know that an awesome way to teach kids to code is with unplugged coding activities? It’s true! You really can introduce coding without using a computer. My son and I have tried a few different coding activities from our Homeschool Unit Study Coding Series and I can tell you it has been a lot of fun. Oh, and, do you know what fruit, turtles, peanut butter and jelly, treasure maps, monsters and beads have to do with coding? Keep reading to find out! I was so excited to find that there are plenty of offline, unplugged coding games to play. I really like the hands-on approach for my son and find that many boys tend to learn very well that way as well. We all try to find a balance when it comes to screen time. While I don’t have an issue with my son begin on the computer and certainly feel that he learns a lot while on it, I think it is important to do a lot of reading and a lot of hands-on activities as well. Adding some offline coding activities to your learning experience is going to be great. What I like about these unplugged coding games is that you can really see why each line of code is important. This is especially true in the activities where you are writing code for another person to follow. 1. Tinkersmith has a neat coding with cups activity for kids that only requires plastic cups, their free printable cards, and writing materials. In this Unplugged Cup Stacking Coding Game you will need a few people to do play, as one person serves as the “robot” and others do the programming. 2. Kodable has a FuzzFamily Frenzy game to play. Similar is style to the Tinkersmith game above you write a program for your “robot” to follow. In this case it is having them jump, grab, squat, drop and move. Sounds like some great action-packed learning. 3. Computer Science in a Box is a group of offline coding activities with printable sheets and simple instructions. Age recommendations start at 9 (but use your own judgment.) Covers: representing information, algorithms, and representing procedures. 4. For The Orange Game you will need a small group of people to play. Watch this video to see how it is done. The CS Unplugged channel has other ideas to try as well. 5. Peanut Butter and Jelly programming LOL. Yup! The programmer has to get the “robot” to make a peanut butter and jelly sandwich. Not as easy as it sounds. This is a great way to get kids to understand that each line of code must be very specific and tells the computer exactly what it must do. 6. This 20 Questions Variation is called 20 Guesses and is an unplugged coding game that introduces information theory. Pick a number and have kids try to guess it. Uses a decision tree and binary numbers. Computational Thinking is a fun monster game. You have to write a set of instructions to have someone create a very specific monster. Free printables included. With Graph Paper Programming kids program each other to draw a picture on graph paper. Using tanagrams and graph paper to learn about Algorithms shows how important it is to have clear instructions when programming. In Functions you work on a hands-on activity with beads and spacers to show repetitive steps and duplication. 11. I really like this unplugged activity because it features a coding treasure hunt. 12. You can also try If . . . Then, Backyard Coding Game for each round there is one “programmer” and everyone else is a computer. The programmer tells people IF I do this, THEN you do that. Variations are included. This is great for a group of younger kids. There are also a couple of fun board games that teach coding offline. We really enjoy games as a way of learning. Robot Turtles Game for ages four and up this game lets kids write programs with cards. This game has gotten a lot of great reviews and teaches kids programming inspired by the LOGO programming language. I am impressed with the idea behind this game for kids who are a bit older. Code Master is geared toward kids 8+ and teaches the fundamentals of sequential reasoning and problem solving skills as well as more complex coding concepts such as loops and conditional branching. With avatars, traveling to an exotic world and a search for power crystals, I would say it looks great! I hope you enjoyed this roundup of unplugged coding games. Try these other ideas for more fun learning opportunities! Thanks Lindsey, Hope you find something interesting to try. These ideas are great, pinning for use with my 9 year old! Thanks for sharing at our Share Day! I think 9 is the perfect age for many of these activities. This is such a great list for coding and I love the code monkey island board game!! Thank you for sharing your post on my facebook page. Thanks! I appreciate your nice comment and having you stop by to see the post. Monkey Island board game caught my eye too! Thanks for putting this together, Susan – pinning because our little one will love working her way through these. Oh, good to hear that the Robot Turtles game is a good one. It looks awesome but we have not played it since my son is too old for it. Glad you found some ideas to try. Thanks for the pin. Oh so many wonderful ideas here, and it’s good to think a little strategically at how to learn coding without just sitting at a computer. You should check out the game RoboRally, it really makes you think about the order in which you do things and is a lot of fun! I think it is good to think about many ways to learn things. I appreciate the suggestion on Roborally. It looks very neat. I love this! We tend to spend too much time at computers or in front of screens in our family, finding ways to leave the screens behind is always a plus, but this is even better, because not only is it away from the screen but it’s helping to foster a hobby my youngest is loving – who knew at 8 he’d love to learn coding? Pinning this so I don’t forget it. Neat that he got hooked on coding. It can be very interesting for sure. Yes, the off screen aspect of this is appealing to many. I like it too because it is another way to learn the concepts and I like to introduce many different ways to learn the same thing. It seems to help really cement the concepts.